You can start Epson Scan from a scanning program to select scan settings, scan, and open the scanned image in the program. Note: With OS X 10.6, 10.7, 10.8, or 10.9, in addition to scanning with Image Capture, you can download and install Epson Scan scanning software. 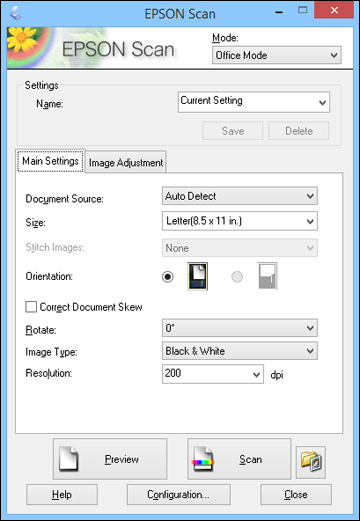 Epson Scan provides additional image adjustment and photo correction features for enhancing scanned images, and provides an interface for TWAIN-compliant OCR scanning software, such as ABBYY FineReader. To download Epson Scan, visit Epson's driver download site (U.S. downloads or Canadian downloads). Note: In certain programs, you may need to select your product as the "source" first. If you see a Select Source option, choose it and select your product. With Windows, do not select a WIA option for your product; it will not work correctly. Note: Epson Scan may start in a different mode when you first access it.